Using highly durable materials makes the Bobcat E14 and E16 hard-wearing and robust. The design features are tested under extreme conditions. We’ve strengthened the boom and dipperstick and use oversized cylinders with a cylinder over-the-boom design. In addition, the tail and sides are made of thick steel plate. So you get more durability and reliability, for greater peace of mind. The E14 and E16 give you top digging performance and more breakout force. You can work in the toughest conditions, in all kinds of grounds. 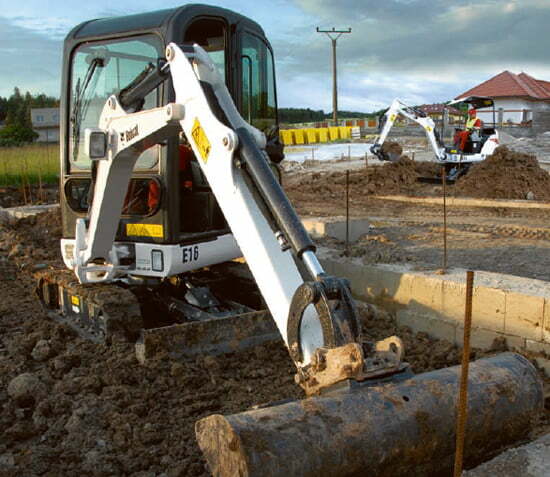 Plus, they can dig close to their undercarriage, for greater productivity in the tightest areas. Picking up and placing heavy items is easy with the E14, which can lift more than 300 kg, and the E16, which can lift more than 350 kg. Smooth operation without any loss of speed or precision: that’s what the E14 and E16 hydraulics offer you. So even in confined spaces, you are more relaxed when operating your compact excavator. 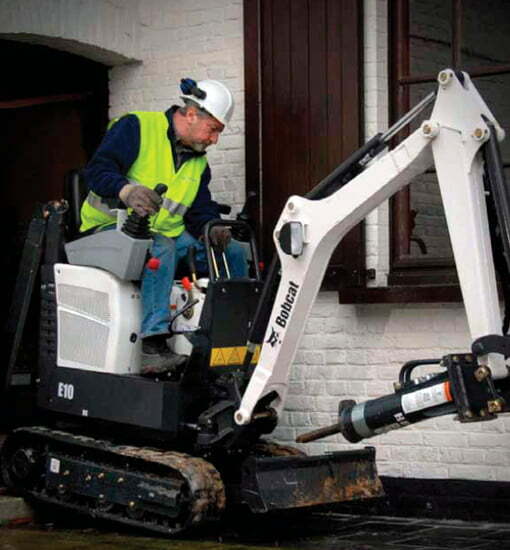 These versatile micro-excavators pack a big punch, whether used for demolition or landscaping work. Thanks to short tail swing, they are less likely to get damaged while working, thus providing a longer service life and lower total cost of ownership. 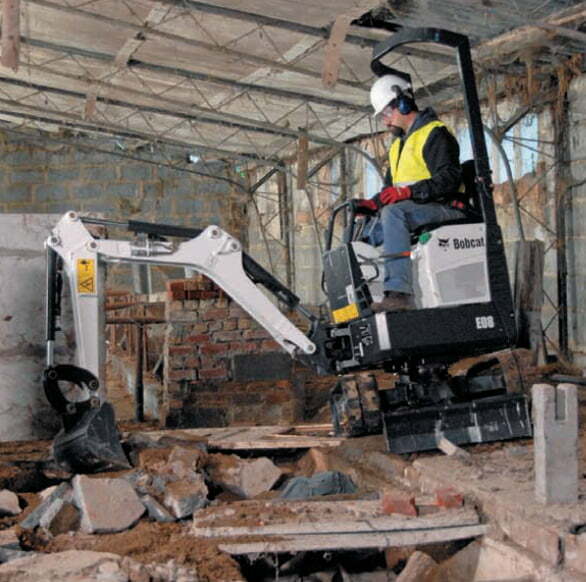 For work with a breaker, the optional demolition kit for both the E08 and E10 provides additional cooling to allow the machines to keep working longer. 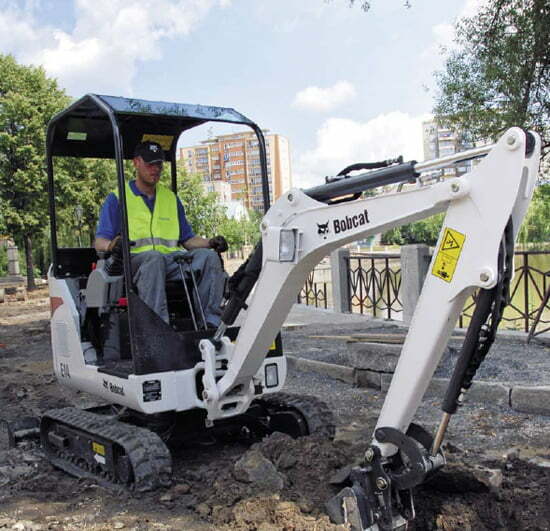 The expandable undercarriage ensures unmatched stability for this size of machine, while retracting easily to allow the excavator to pass through narrow openings. Combined with the integrated, foldable TOPS, it means that 710 mm wide, low-headroom openings are no barrier to these machines! Low noise and vibration levels ensure excellent operator comfort along with reduced environmental impact. The adjustable joystick controls on the E10 take comfort to unequalled levels.